I'm traveling light this trip. 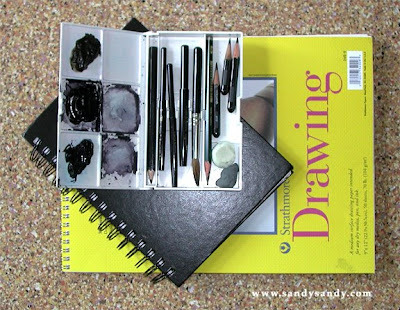 Here's a picture of my little sketching box and two different sized sketch books I brought along with me. I did throw in some colored pencils right before I left the studio this morning. I used the small sketchbook on the plane today and did a few paintings using my pencil and wash technique. See my Colorado drawings, starting July 22nd on my Sketching Everyday Blog. Your blog is inspirational! After a 25yr gap I've just unearthed my sketchbook.In 1983 we lost our historic house, my studio, pets and our 3 acre historic hills garden. It somehow put a damper on my painting & other artistic activities. Thank you so much for your Colorado wildflowers & scenery. I desperately miss northern hemisphere nature since air travel does not agree with 2 replaced heart valves. I love the Rockies and miss the wolves, elk, bears, lakes,melt streamswoods and wildflowers. Thanks again for my nostalgia trip.